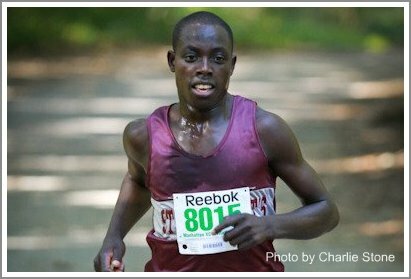 Can Cheserek make it three in a row? Mid-October is when the elite really start to race. It typically marks the beginning of a month long tune-up process where coaches slowly remove the restrictive race strategies and let their stars spin their wheels. So if that’s the typical pattern for athletes with national championship aspirations, what has Edward Cheserek been doing? Cheserek has been crushing course records over the past few weeks and appears to be firing on all cylinders. Two weeks ago, the St. Benedicts (NJ) star opened his season by demolishing the course record at the Passaic Coaches Invitational, covering the 5,000 meter Garrett Mountain course in 14:53. For an encore, he returned the following week to set another course record at the Manhattan Invitational. Cheserek won that race in 11:55.39 for 4,000 meters. But don’t let the sizzling early season pace fool you. Cheserek is not the top ranked runner in the nation by accident. His performances over the past few weeks are simply the foundation for a run at a national championship in early December. Garrett Mountain is a legitimately challenging course, and a sub 15 minute performance there leaves frightening possibilities for the Brown Invitational course. The meet management has the official layout listed at 5,000 meters, but running purists in New England will debate that fact. A fast course that may be slightly short leaves only one possibility....... Cheserek will break 15 minutes and capture another course record if he decides to race all-out. Having Edward Cheserek in the field forces some early decisions for the rest of the front pack. Do they attempt to go with him? Do they simply let him go and monitor the next major move from within the chase pack? One thing is certain, you had better be confident in the strategy you choose and commit to it wholeheartedly. The worst place to be, is stuck between the best runner in the country and a chase pack that is using you a prey. There are several individuals with the bravado and credentials to attempt to cover Cheserek’s initial move. 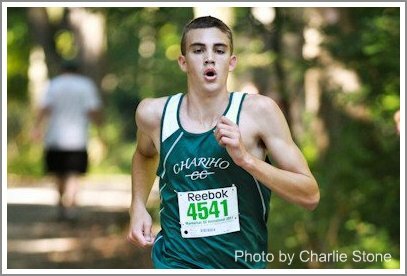 Mike Marsella (Chariho, RI) is currently ranked US#20 and posted the 3rd fastest time of the day (12:43) last weekend at the Manhattan Invitational. His team won the “B” race in that event with an impressive 61 points, and they certainly made a statement by taking 1-2-4 and 7. Jake Kilcoyne, Dan Kilcoyne, and Bryce Kelly will once again be critical components to Chariho’s success. Chernet Sisay has appeared in the headlines each week for the last month. 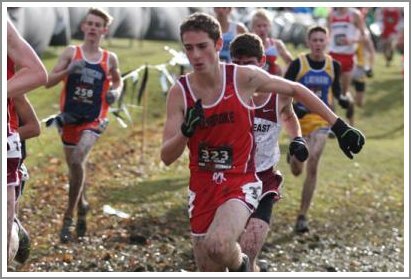 Deservedly so, the Brookline senior has not lost a race this season. Known for his massive aerobic capabilities, Sisay has yet to be truly pushed in the middle section of a race. But Sisay is not one dimensional. He demonstrated tremendous early season foot speed as he tracked down the leaders with 800 meters to go in the Bay State Invitational. His job that day was to pace his teammates, and he did so until the very last possible minute. That team mentality is what has propelled Brookline to the #1 spot in Massachusetts. The Warriors will bring depth with Mark Perry and Aaron Klein, and the pair should be a good match-up for the group from Chariho. St. Anthon’s (NY) is currently ranked US#30 and NY#3. They won the Randolph Invitational with an astounding 38 points and finished 6th at the Reebok Manhattan Invitational Championship Division. The Friars might not place anybody in the top 10, but they will kill you with depth. At the Randolph Invitational they went 4-5-6-11-12 with a 27 second 1-5 gap. When the quality of the field was elevated at the Manhattan Invitational, the gap stretched to 48 seconds; still solid enough to make them dangerous in any field. Wes Gallagher was featured with his Pembroke teammates in our Workout of the Week segment cruising through 1,000 meter repeats with relative ease. The defending Massachusetts Division 2 Champion is rounding into form and looks very strong. His team also looked very good after finishing 3rd behind two nationally ranked programs at the Bowdoin XC Classic. Gallagher was second that day (16:22) on a very slow and muddy course that truly tested the strength of the field. Amherst (MA) – Currently ranked MA#4 in Division 1. Finished second at the Amherst Invitational behind MA#1 Brookline. La Salle Academy (RI) – Finished second in the 2010 Rhode Island State Meet. Londonberry (NH) – Finished 4th in the 2010 New Hampshire State Meet. Ludlow (MA) -Currently ranked MA#13 in Division 1. Finished 4th in the Red Division and the Great American Cross Country Festival in North Carolina. Dan Crowley won that event in 15:58. Marshfield (MA) – Currently ranked MA#7 in Division 1. Joel Hubbard finished 4th at the Brown Invitational in 2010 (15:18) and Kevin Thomas finished 10th (15:34). North Kingstown (RI) -Finished 4th in the 2010 Rhode Island State Meet, but lost their top 2 to graduation. Peabody (MA) – The team recently fell out of the rankings in Massachusetts, but Nick Christensen looks poised to impact the individual scene. Christensen set a course record at Swampscott on Tuesday and has traditionally started his true racing season on this weekend. Sachem East (NY) – Finished second in the 2010 Brown Invitational. Sandwich (MA) – Currently ranked MA#6 in Division 2. Just beat MA#7 Dennis-Yarmouth in a dual meet on Tuesday even with resting their #2 and #5 runners. Whitman-Hanson (MA) – Currently ranked MA#17 in Division 1. They struggled with depth at the Bay State Invitational, but Pat Ryan looked very comfortable in the lead and should be in the front pack on Saturday. Lexington (MA)- They won't have a team in the field, but they will send their junior star Nat Adams to contend with the best. Adams finished 19th at this meet in 2010 as a sophomore and had a breakout track season in the spring. Dover (NH) - James Goden was 11th at the New England Championships in the 3200m and opened the season with a second place at the Bobcat Invitaitonal in New Hampshire.